Price includes: $500 – 2018 Returning Lessee 38CJB3 (EP compatible). Exp. 04/30/2019, $1,500 – 2018 Non-Prime Retail Bonus Cash **CJ1V. Exp. 04/30/2019, $500 – 2018 Chrysler Capital 2018 Bonus Cash **CJ5 (exclu. MW-NE-SE). Exp. 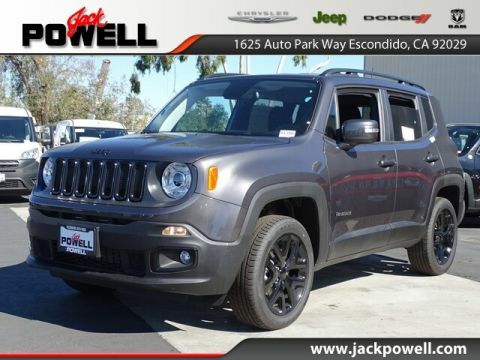 04/30/2019, $2,250 – 2018 Retail Consumer Cash 71CJ1. Exp. 04/30/2019, $750 – 2018 CCAP Non-Prime Retail Bonus 44CJA1. Exp. 04/30/2019, $500 – Freedom Days Retail Bonus Cash 44CJA8. Exp. 04/30/2019, $1,000 – 2018 Retail Bonus Cash CACJA1. Exp. 04/30/2019 SAVE SAVE SAVE TODAY! BIG SALE PRICES BUT EVEN BIGGER SAVINGS ON EVERY NEW CAR IN STOCK! 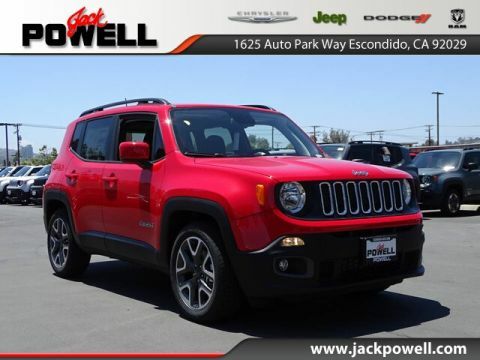 Colorado Red 2018 Jeep Renegade Latitude 4WD 9-Speed 948TE Automatic 2.4L I4 Renegade Latitude, 4D Sport Utility, 2.4L I4, 9-Speed 948TE Automatic, 4WD, Colorado Red, Black Cloth, 1-Year SiriusXM Guardian Trial, 5-Year SiriusXM Travel Link Service, 6 Speakers, 8.4″ Touchscreen Display, AM/FM radio: SiriusXM, Automatic temperature control, Cluster 7″ TFT Color Display, For Details Visit DriveUconnect.com, Front dual zone A/C, Front reading lights, GPS Navigation, HD Radio, Heated door mirrors, Illuminated entry, Leather steering wheel, Manufacturer’s Statement of Origin, Passive Entry Remote Start Package, Passive Entry/Keyless Go, Power door mirrors, Power steering, Power windows, Quick Order Package 2EJ, Radio: Uconnect 4C Nav w/8.4″ Display, Remote keyless entry, Roof rack: rails only, SiriusXM Traffic Plus, SiriusXM Travel Link, Spoiler, Uconnect 8.4 Nav Group. Price includes: $500 - 2018 Returning Lessee 38CJB3 (EP compatible). Exp. 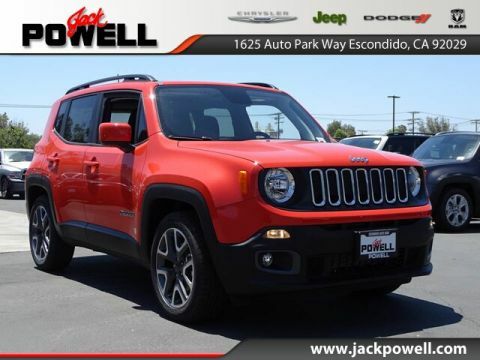 04/30/2019, $1,500 - 2018 Non-Prime Retail Bonus Cash **CJ1V. Exp. 04/30/2019, $500 - 2018 Chrysler Capital 2018 Bonus Cash **CJ5 (exclu. MW-NE-SE). Exp. 04/30/2019, $2,250 - 2018 Retail Consumer Cash 71CJ1. Exp. 04/30/2019, $750 - 2018 CCAP Non-Prime Retail Bonus 44CJA1. Exp. 04/30/2019, $500 - Freedom Days Retail Bonus Cash 44CJA8. Exp. 04/30/2019, $1,000 - 2018 Retail Bonus Cash CACJA1. Exp. 04/30/2019 SAVE SAVE SAVE TODAY! BIG SALE PRICES BUT EVEN BIGGER SAVINGS ON EVERY NEW CAR IN STOCK! 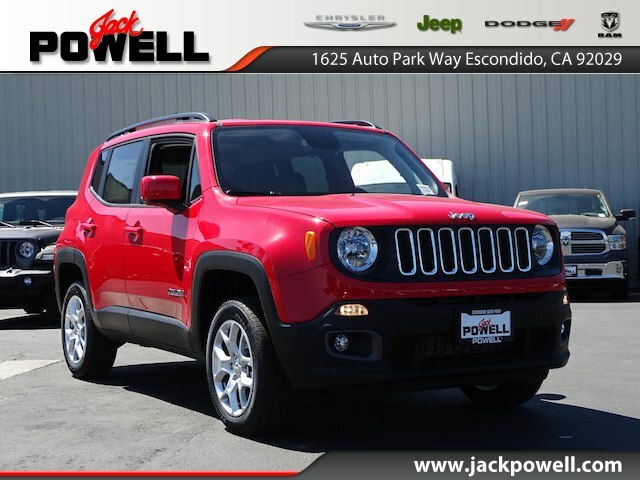 Colorado Red 2018 Jeep Renegade Latitude 4WD 9-Speed 948TE Automatic 2.4L I4 Renegade Latitude, 4D Sport Utility, 2.4L I4, 9-Speed 948TE Automatic, 4WD, Colorado Red, Black Cloth, 1-Year SiriusXM Guardian Trial, 5-Year SiriusXM Travel Link Service, 6 Speakers, 8.4" Touchscreen Display, AM/FM radio: SiriusXM, Automatic temperature control, Cluster 7" TFT Color Display, For Details Visit DriveUconnect.com, Front dual zone A/C, Front reading lights, GPS Navigation, HD Radio, Heated door mirrors, Illuminated entry, Leather steering wheel, Manufacturer's Statement of Origin, Passive Entry Remote Start Package, Passive Entry/Keyless Go, Power door mirrors, Power steering, Power windows, Quick Order Package 2EJ, Radio: Uconnect 4C Nav w/8.4" Display, Remote keyless entry, Roof rack: rails only, SiriusXM Traffic Plus, SiriusXM Travel Link, Spoiler, Uconnect 8.4 Nav Group.